The market continued to behave in an orderly fashion. An early test down in thee Russell found good support and a higher low was put in relative to the globex low. Despite the fact that the Russell futures made an all time closing high, no indicators are overbought. Even the short term summation tick is neutral. Friday is the last day of the month. Big win for fund managers over the month of February, but other markets continue to make new contract highs as well. 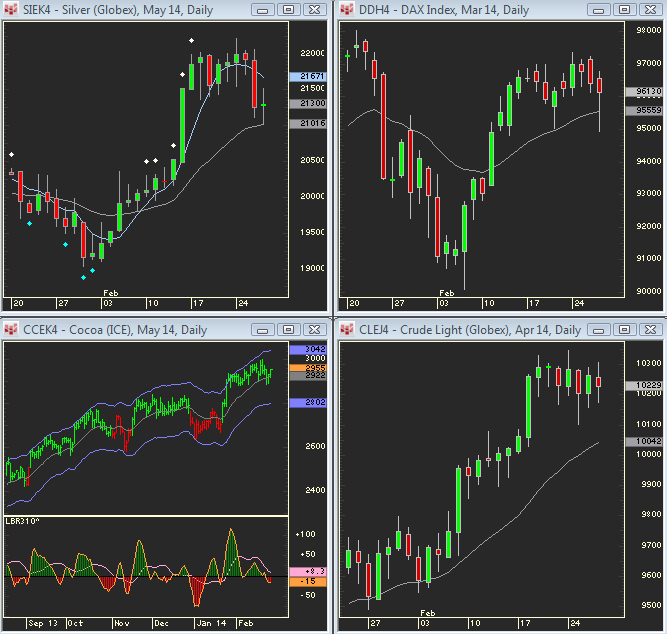 The Russell has had 15 closes on one side of the 5 SMA, but it has had up to 24+ closes on one side in the past. The first close below would still set up a Buy, so no reason to look for short positions until this testing process is through. Of course, intraday scalping opportunities continue to unfold in both directions. The DAX closed with a Pinball Buy after two days high to low and can trade higher before the NYSE opening on Friday. Silver has retraced back to its daily EMA and the daily oscillator is on a buy. Both gold and silver had pinball Buys on Thursday but still need a higher low on the hourly charts. Gold is forming positive consolidation – higher lows as the daily oscillator corrects back down. Cocoa remains on a daily Buy. Crude has a pinball Buy and quite a breakout coil has been unfolding. 10 and 30 year yield charts are working on a retest of the last daily swing low. They may punch through this. In the meantime, any further rally in tens bonds and bunds is a short scalp but there will be grail buys on any retrace to the 120 minute EMA.